Thread: How to wiring for equalizer to reciever? 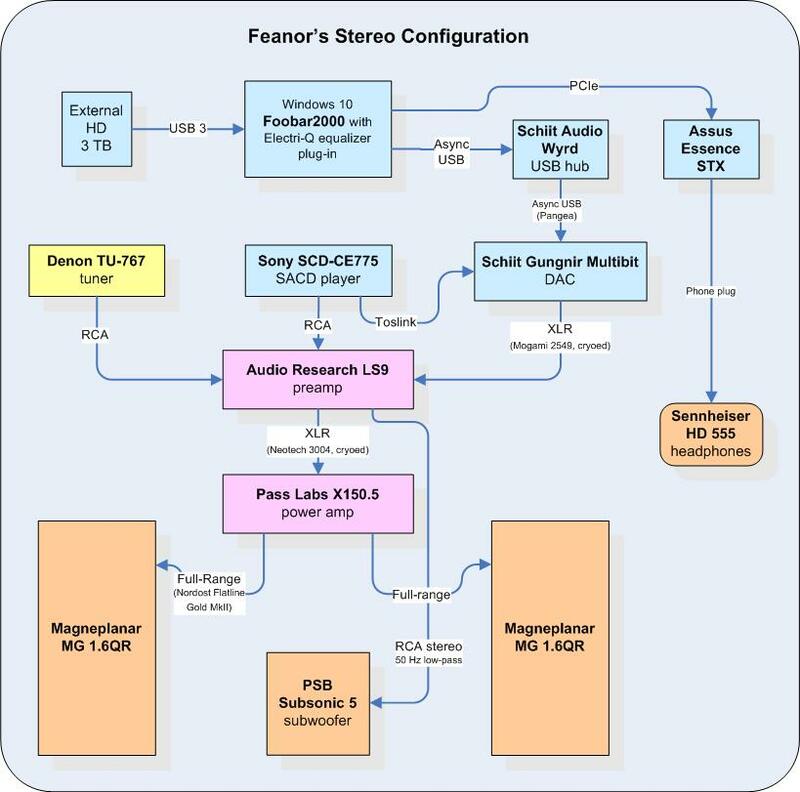 Can anyone help me with wiring a audiolinear eq to a sony surround sound reciever? Would muchly appreciate any and all help! Help!! Wiring is messing with me! Didn't the equalizer come with instructions ? What model Sony receiver ? Hook up the receiver to a tape loop on the receiver. Plug the R + L inputs of the equalizer into the receiver's TAPE OUT jacks. Plug the R + L outputs of the equalizer into the TAPE IN jacks. Set the receiver's tape function to MONITOR or TAPE PLAY -- this will allow the signal from the receiver's input selector to be routed through the equalizer via the tape circuit. Note that the equalizer will only affect the front/main channels. Didn't the equalizer come with instructions ? What model Sony receiver ? Hook up the receiver to a tape loop on the receiver. Plug the R + L inputs of the equalizer into REC jacks of the receiver's tape loop. Plug the R + L outputs of the equalizer into the PLAY jacks of the receiver's tape loop. Set the receiver's tape function to MONITOR (tape play ?) -- this will allow the signal from the receiver's input selector to be routed through the equalizer via the tape circuit. Note that the equalizer will only affect the front/main channels. Well, tape circuit OUT jacks are usually always live. The circuit obviously must have an option to play a tape. When the source/tape switch is in the tape play position, the circuit is effectively the same as a processor loop. Good point. It doesn't say "monitor". Big difference. Most modern tape receivers don't have a "Tape monitor" in the traditional sense in that actually "breaks" the signal continuity in the receiver. A true "tape monitor" would send the signal to a device via the "out" jack and then return it back into the receiver's signal chain by way of the "in" jack. If there was no device active, then depressing the "tape monitor" switch would cause silence. This was a really nifty feature when used with a three head tape deck (remember those?) so you could monitor (listen to) the actual signal being recorded on the tape and being played back simultaneously. The way modern receivers work, and somehow I think this fits here, is that while it may allow a signal to be sent out to an external device and a signal to be input to the receiver from said device, it's more of a one way trip both ways, where on the in and out have no direct relation to each other. Again, as Jim said, a pre-out and main-in insertion would work if your receiver allows. Well, tape circuit OUT jacks are usually always live. True that. It's a convenient way to send a two channel analog signal to external devices before the volume control. The circuit obviously must have an option to play a tape. Again, true that, but not necessarially in a "monitor" scenario, as I described in the above.. When the source/tape switch is in the tape play position, the circuit is effectively the same as a processor loop. Well, here we differ. It's most likely just another high level input. If it's not a break in the signal path then it's not a true tape loop, and this would not work. In such case the eq would have no effect on the sound. Since it's not labelled "Tape Monitor" and having had experience with hooking tape recorders up to these new fangled receivers, my money is on this. "Mr. Bailey, as a safety feature, we don't allow TAPE IN and TAPE OUT to be used as a straight loop (processor loop). This has the potential to cause feedback and damage equipment (it's happened before). ..."
You're probably right. My multichannel receiver allows routing of sources the tape outs independent of the input selector but I have never used the feature and can't confirm whether it could work as a processor loop. My 2-channel preamp splits the tape circuit "old-school" style when the TAPE button is pressed.